If you're willing to bundle up a little more than, say, what you would in mid-October to hit the trout streams of north Arkansas, you're going to have some fun, our Fishing Report sources say. 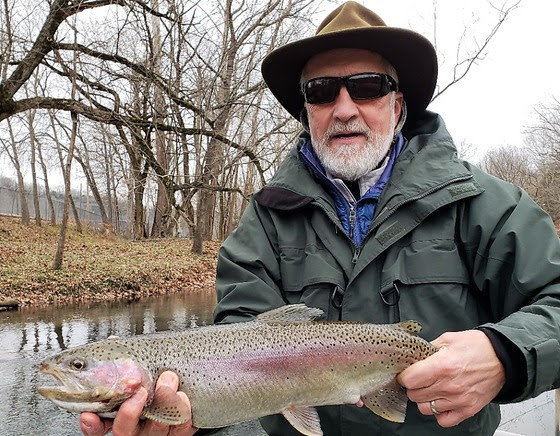 Mark Crawford, who passed along the photo, says the Spring River is just right for hungry rainbows and the river has been "looking great. It is low, and we could use some rain in the area. There were some warm days over the weekend with OK fishing, but the cold snap last few days has the fish feeding hard.Y2Ks have been hot for a few weeks now. Big ones caught." Spin-fishing will work with Trout Magnets. "The colder the weather the harder the hits! Trout love it," Mark said. Over on the White River below Bull Shoals Dam, the folks at Cotter Trout Dock remark that the cold temps also mean fewer anglers on the river, and that just means more opportunity for the trout anglers. There is more water release from the dam for power consumption, and "like we always say, the really good news is that trout love cold water and they love lots of water. While the releases from Bull Shoals Dam have been relatively judicious, anglers have had an easier time navigating to the deeper holes, yet bank fishing hasn't been negatively impacted to any great degree. The added depth offers more confidence in casting some of the favorite stick baits (those No. 5 countdowns are continuing to prove successful) and larger streamers. The brown trout have given some attention to sculpins, even in the middle of their annual spawn." And, Sportsman's White River Resort noted a lot of walleye up by the dock this week, as well as few anglers braving the elements.